Yakshas were tree spirits or nature deities of ancient India, who were also integrated into the repertoire of Buddhist art as guardians of the underworld and its mineral treasures. This is why yakshas are often represented on the lower level of pillars or steps, as the protectors of the point of junction where the underworld meets the surface of the earth. They are analogous to the atlantes of classical Greek and Roman architecture, male figures who function as a column supporting an entablature, which over time in India were assimilated as dwarfish, gnome-like figures rather than tall, valiant athletes. In Hindu mythology, the gana attendants of Siva have a comparable supportive function and impish appearance. Here we see a yaksha or gana crouched within stylized rocks, as if in a cavern. The rocks are enclosed by a plain border, emphasizing the meeting point between the yaksha’s body and the greater area he protects. A stone block of this type would have been inserted into the plinth of a building or else a lintel, as there is only frontal carving (as the sides and back are unfashioned, it could not have formed a cornerstone or part of a column). These deities are considered by nature to be extremely supple, and their bodies often appear contorted, with bulging biceps or calves, in curious supportive positions within a rectangular space. Here the yaksha rests on his ample stomach on the ground as he places his heavy, load-bearing weight on his spread hands and feet, while still conveying a friendly and relaxed demeanour, with no sense of exceptional exertion. His curly beard and long hair (the wavy locks are missing on the right side of the head) recall the antecedents of these figures in the European atlantes. 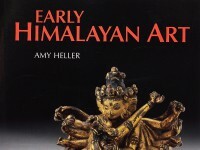 During the Licchavi period, when Gupta artistic and architectural norms were assimilated in the Kathmandu valley, similar rock formations, replete with squatting yakshas or ganas or crouching lions, were sculpted in stone as bas-reliefs for stupas, as well as supports of pilasters or fountains, particularly at Deopatan . Although his body is less contorted than some, the fleshy lips and pointed beard of the present figure are characteristic of the Licchavi period, as are the rhomboid stylized rock formations in which he crouches . 1 See Slusser, Nepal Mandala, vol. 1, p. 177, for discussion of extant Licchavi columns with ganas in Kathmandu, and vol. 2, pl. 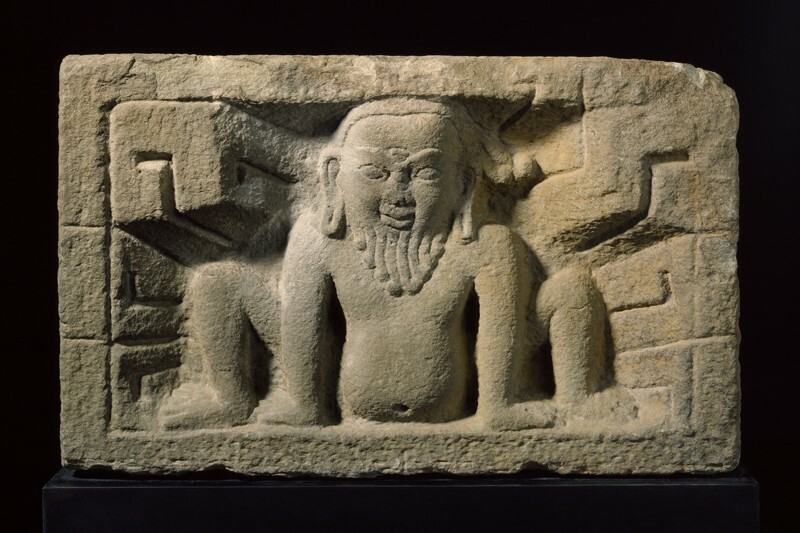 298, for an in situ example of a bearded squatting yaksha as the base to a Licchavi stone column in Deopatan, Kathmandu; pl. 242, for a half-buried gana supporting a pillar at Bhaktapur, Kathmandu; and pl. 306, for a Licchavi water spout with an exceptionally handsome bearded gana at Deopatan. A further gana relief in the Victoria and Albert Museum, London (I.S. 145-1986), is attributed there as ‘probably from Deo Patan, c. eighth century’. 2 See Pal, A Collecting Odyssey, pl. 86, for a tenth-century example of a stone yaksha from Kathmandu, crouching within stylized rocks but lacking a beard or wavy locks and adorned with scarves. A semi-divine male nature spirit.